Opening this spring just 20 minutes north of downtown Asheville. Navitat Canopy Adventures combines the exhilaration of a zip-line tour with the educational experience of a Costa Rican rainforest-style tree canopy excursion. Situated on a 240-acre tract of century-old forestland near Barnardsville, N.C., the course is comprised of artfully constructed platforms nestled in the trees and connected by a series of sky-bridges, trails, zip lines and rappels. The course will vary in height from 2 feet to more than 200 feet off the ground, and zip lines range from 50 feet to 1,100 feet in length. Imagine exploring a century-old forest from high among the treetops, watching a bird fly below as you traverse a sky-bridge, or gliding across a wide valley floor – all against the backdrop of western North Carolina’s beautiful mountains. NAVITAT CANOPY ADVENTURES is combining the exhilaration of a zip line tour with the educational experience of a Costa Rican rainforest-style canopy excursion to create a new outdoor adventure just 20 minutes north of downtown Asheville, N.C. Tours begin in mid-April. Designed by Bonsai Design Inc., the leading canopy tour installer in the country, the course will be comprised of artfully constructed platforms nestled in the trees and connected by a series of sky-bridges, zip lines and rappels. Guests will be escorted at all times by experienced guides as they move through the course. The design is entirely tree-based and uses no poles or other structures to support the platforms and course features. Upon completion, the course will vary in height from 2 feet to more than 200 feet off the ground, and zip lines range from 50 feet to 1,100 feet in length. The course is situated in Moody Cove, a 240-acre tract of forestland just north of Barnardsville. The site is home to forests of hardwoods -- some more than 100 years old -- native and rare plant species, streams and mountain wildlife. Environmental stewardship is one of NAVITAT’s core values. The company commissioned a complete inventory of the site’s natural resources and has established a management plan for non-native invasive plant species. Designers and builders are using sustainable practices and products in the construction of the course and Welcome Center, where guests can learn about the natural history of the area. When fully operational, NAVITAT plans to employ approximately 30 staff members. NAVITAT tours begin in mid-April, but you can make reservations now at www.navitat.com. Tours last approximately 3 ½ hours, including orientation and ground school where you learn proper zip line techniques. Cost is $85 per person for adults, and $75 per person for children ages 10-16. NAVITAT Canopy Adventures is a member of the Association for Challenge Course Technologies (ACCT), which is accredited by the American National Standards Institute. The company adheres to and exceeds all ACCT standards for construction, operations and training. A week ago I received an email from an old friend that recently graduated from nursing school. Prior to getting a job as a nurse she wanted to travel and enjoy life for a few months. Then the earthquakes of Haiti happened and within 36 hours she was there, helping out in any way she could. Now she is back in Asheville, working at Mission Hospitals and is organizing a tent drive to shelter as many people as she can in Haiti. Several of our Chamber members are working with here to make this as successful as possible. My name is Jessica Hardy. I am an RN at Mission Hospitals, and have recently returned from 18 days in Haiti. Committed to helping ease what is preventable suffering, I am organizing a tent/tarp drive in the Asheville area. I have free shipping and an unaffiliated ground crew in Haiti to receive and distribute. I realize many of us have donated already, but please consider this opportunity. Millions of Haitians are living in the streets, housed by bed sheets hung on rubble. As we approach the rainy season (May-July), followed by the hurricane season (July-October), the near future for many Haitian families is terrifying. If we do not help provide weather resistant shelter we will see another massive wave of death due to exposure. Those most vulnerable: infants, the elderly and the sick, will, without question, die. As an involved, active, and moral community we have a responsibility to help those who cannot help themselves. Please bring a tent or tarp, new or used to one of the following drop off locations any time between March 1st and March 31st. This is your opportunity to share in such a way that you will save lives. From your basement or garage, straight to Haiti, you will be responsible for a family’s survival. I am more than happy to share my story, more photos, my time. If I can be of assistance in your decision to Cover Haiti, please email me at coverhaiti@hotmail.com. The American Chamber of Commerce Executives (ACCE) today announced the publication of a new study detailing the credit scores and payment behavior of ten local chambers of commerce across the United States, comparing their member businesses with other regional, state and national business averages. Produced by Cortera™, a community-driven business credit bureau, on behalf of ACCE, the study includes the Bowling Green (KY) Area Chamber of Commerce, Greater Boca Raton (FL) Chamber of Commerce, Greater Durham (NC) Chamber of Commerce, Greater Omaha (NE) Chamber of Commerce, Helena (MT) Area Chamber of Commerce, Lake Champlain (VT) Regional Chamber of Commerce, Lubbock (TX) Chamber of Commerce, Salem (OR) Area Chamber of Commerce, San Diego (CA) Regional Chamber of Commerce, and Tulsa (OK) Metro Chamber. According to the study, chamber of commerce members possess an average credit score of 629, compared to a 557 average score for businesses at large. Such scores – the payment behavior from which they are derived -- play a significant role in attracting lines of credit and securing favorable terms from lenders and suppliers. A complete copy of the study, which includes both the aggregate findings, as well as the individual commercial credit scores for each of the ten local chambers, is available on the ACCE and Cortera sites. The study was contracted by ACCE and performed by Cortera, which reviewed payment behavior for chamber member businesses. "Chamber members have long been seen as responsible and reliable members of their community," said Mick Fleming, president and CEO of ACCE. "What this study indicates is that the perception is right. From a credit standpoint, chamber members on average are better businesses, and as a result they have significant advantages in obtaining the funds they need. In this economy and the tight credit environment we are experiencing, that's especially important." "The economic health of the entire supply chain is dependent on the payment behavior of each of its stakeholders," said Jim Swift, president and CEO of Cortera. "This study suggests that chamber members are among the most dependable participants in this ecosystem." Established in 1914, ACCE is the only national association serving the professional development needs of chamber professionals throughout the United States and Canada. Representing more than 7,300 individuals, ACCE enhances the knowledge, leadership skills, and management effectiveness of chamber executives and their staff through education, benefits programs, trend analysis, benchmarking, and network development. ACCE promotes the highest standards of professional excellence and integrity within the chamber profession. This week Posana Café in downtown Asheville furthered their commitment to the community by becoming the only 2-Star Certified Green Restaurant® in North Carolina. “We believe that we had to go beyond just ‘saying’ that we were committed to the environment, and really put ourselves to the test,” says Posana co-owner Martha Pollay. The certification is awarded by the Green Restaurant Association (GRA), a non-profit organization that specializes in helping restaurants become more environmentally sustainable through their Certification program and consulting services. Located on Asheville’s historic Pack Square, Posana Café began working toward GRA certification in 2009. “We decided from the start that we wanted to reduce our impact on the environment,” explains Peter, “And now, when we show our ‘Green Restaurant’ certification to our customers, they’ll understand that we are willing to hold ourselves accountable to a totally objective institution that can monitor how well we achieve our goals.” Posana Café is one of only 265 restaurants in North America that can call themselves a Certified Green Restaurant®, while the GRA currently works with over 650 restaurants in the U.S. and Canada. Before Posana Café was even open, they incorporated environmentally sound materials and eco-friendly building procedures into remodeling the restaurant for the grand opening in May of 2009. “Our bar top is crafted from Kirei Board, a material made from compressed sorghum stalk and we utilized sustainable products such as Paperstone, Icestone and Torzo on our other surfaces,” says Martha Pollay. “In addition, our carpeting is cradle to cradle and made from a minimum of 25% recycled material and our walls are painted with low VOC paint.” GRA statistics claim that restaurants throw away 100,000 pounds of garbage each year, but Posana Café uses no Styrofoam and has a thorough composting and recycling program. I received this note from our friend Marta at the Venue about an event they are hosting for to raise funds for Haiti Relief. 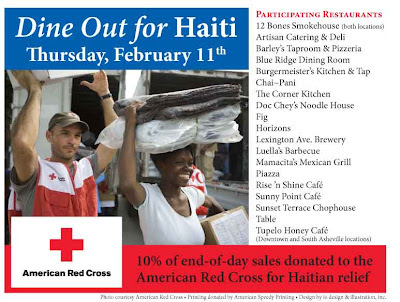 We would love to see everyone at this party to help out Haiti. Admission is $5.00 and the option to bring a medical supply (i.e. bandages, first aid kits). There will also be a donation jar in case you want to help out even more. The party upstairs is for teenagers aged 14-19. The party on the main level is for adults 20+. DJ from Sound Extreme Entertainment will be there to play the hottest music of today! THE UNKNOWN will also be there to perform. They are the newest hip hop dance crew in Asheville! Bands that will be playing, The Vinyl Brothers Big Band, Rattle, and The Mike Luca Project. This Party will be fun for everyone and you'll feel good about Helping Haiti all at the same time! In conjunction with Asheville Pizza and Brewing Company, the Orange Peel announces a screening of world musician Bela Fleck’s award-winning documentary “Throw Down Your Heart,” on Thursday March 5th at the Merrimon Avenue location, at 7pm. The film follows multiple Grammy Award-winning banjo player Bela Fleck as he travels through four African countries exploring their musical traditions and recording his new album, also entitled "Throw Down Your Heart," released in 2009. Along the way, Fleck searches for the banjo's early roots, which may have traveled along via the slave trade to America. The album, released last year, just won 2 Grammy’s – for Best Pop Instrumental Performance and Best Contemporary World Music Album – at the 2010 Grammy Awards. The documentary won the Audience Award at the Vancouver International Film Festival and the SXSW Film Festival in 2008. Tickets for this event are only $5, and all ticket sales, as well as 10% of the bar and food proceeds collected, will be donated to the American Red Cross to aid in their earthquake relief efforts in Haiti. The following week, the Orange Peel is bringing the star of the film, Bela Fleck, to Asheville on Friday March 12th for his Bela Fleck: The Africa Project tour, featuring African musicians Bassekouye Kouyate & Ngoni Ba, and Anania Ngoliga with Guitarist John Kitime. Tickets for the film are available in advance through the Orange Peel box office on Biltmore Avenue or online at www.theorangepeel.net . They will also be available beginning the day of show, March 4th, at the Merrimon Avenue location of the Asheville Pizza Company. Tickets for Bela Fleck’s concert at the Orange Peel March 12th are still available and can be purchased at the Orange Peel box office, or online at www.theorangepeel.net . The impact of healthcare reform in Washington will make dramatic changes to the care delivery services and the payments received for medical services. The event will be begin at 5 p.m. on February 18 at CCNC-A’s comprehensive cancer center. When: Wednesday, February 17, 2010, 6 p.m. - 7 p.m.
To get hired these days, you must not only be a qualified candidate but be an exceptional job seeker. A career club provides a supportive environment that helps sharpen skills, maintain positive and hopeful attitudes, and could be that missing piece to finding the right opportunity. Jane Falter, is the local career club leader with WaggleForce.com, a recent initiative started by Tory Johnson, ABC's Good Morning America Workplace Contributor. These clubs are working collaboratively to get communities back to work. Join us for a free information session and presentation on the “Science of Networking and the Art of Connection” given by Peggy Collins. Peggy is a professional speaker, trainer and author of Help Is Not a Four Letter Word. Peggy has been interviewed by many radio and TV shows and her book has appeared in over 18 magazines and publications. This session will be held on March 2nd from 1pm to 3pm in the Wachovia Room at the Asheville Chamber; a light lunch will be served. Jane Falter had an extensive career in human resources and is currently a life and business coach located in Hendersonville. For more information about the career club and to confirm your attendance, please send an email to jane@janefalter.com. Artisan Catering, Inc. is pleased to announce it has been selected as a 2010 winner in The Knot Best of Weddings, a special section in The Knot North Carolina magazine and on TheKnot.com . The Knot is the number-one wedding resource highly trusted by brides. Mark your calendars for Thursday, February 25th at 7 pm. You won't want to miss this fun and fabulous event to benefit The Health Adventure! Come to the Grand Ballroom of The Grove Park Inn dressed in red and ready for a great show featuring local talent from our community. Counted among the entertainers scheduled to perform are Tuxedo Junction, Mark Knollman, DDS, Joe Brumit, local sensation Bradshaw Call, Rusty Owen and Keith Challenger, Randy Flack and more surprise special guests! February is American Heart Month, and The Health Adventure gratefully acknowledges the generous hearts of our sponsors for this event: The Grove Park Inn Resort & Spa and Mission Medical Associates and its newest member, Asheville Cardiology Associates. Have a heart and help us spread the word about this event by forwarding this invitation to your friends! Charlotte Street Computers Needs Your Old Computers! Charlotte Street Computers in need of recycled computere for community donations! Charlotte Street Computers is in need of old computers for their computer refurbishing program. E-cycleme, the computer recycling division of Charlotte Street Computers has been refurbishing computers for donation to Asheville area citizens, students, and community centers for the last 2 years. Computer tower and laptop donations are free; monitors, keyboards, and mice are also accepted for a nominal fee. If you would like to contribute to Charlotte Street Computers' cause, please drop off your old computers at their location at 101 South Lexington Avenue in downtown Asheville or contact Nelson Parets at nparets@charlottestreetcomputers.com for more information. The Asheville Area Chamber of Commerce is pleased to announce that the Young Professionals of Asheville (YPA) and the Chamber have entered into a partnership to deliver the finest development opportunities for our community’s future leaders. 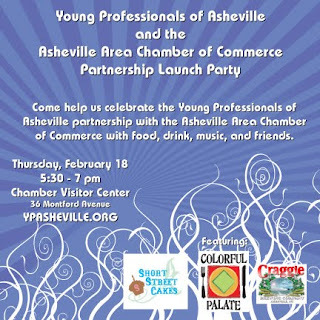 To celebrate this new relationship, the Chamber and YPA will be hosting a celebration for Asheville’s young professionals on February 18, from 5:30 to 7 p.m. in the Visitor Center at the Chamber Building. The YPA program is focused on business networking, personal growth, leadership development, and social interaction for individuals in the Asheville area between the ages of 21 and 40. Any young professional in the area is welcome to participate in YPA programs with discounted program rates offered to Chamber members and their employees. “Partnering with the Chamber will allow YPA to reach many more young professionals in our community and create opportunities that we would not be able to accomplish independently,” said Grant Gosch, President of YPA, and Director of Business Development at First Light Solar. The celebration on February 18 will showcase some of the many talents of Asheville’s young professionals. The Colorful Palate will be providing hors d’oeuvres, Short Street Cakes will provide dessert, and Craggie Brewing Company will be providing local craft beer for the reception. For more information on the celebration please visit ashevilleypa.com. Start your Valentine’s weekend with a Saturday morning art experience on February 13th from 10-Noon. BlackBird hosts a reception for Jenny Boudreault (her captivating paintings can be seen on BlackBird’s website or Facebook page – or on the cover of WNC Woman). Enjoy some delicious treats and fresh coffee while savoring her work. The first 14 who bring a snapshot of their Valentine will receive a free 5x7 frame and professional fitting. More at www.blackbirdframe.com. Love, in its true form, embraces all aspects of its subject. Painter Jenny Boudreault’s love for her own subjects is manifest in her precise and sensitive portrayals. Describing her own work, she says, “Whether one chooses to conceal his past or put it on display, he wears his experiences, recorded in each wrinkle, every scar. In my paintings I explore the individual experiences that have shaped my subjects.” Applying india ink to richly grained wood panels, and overlaying a veil of color and visual texture, Boudreault lets the viewer feel as though one is seeing beneath the skin, into the heart and true meaning of the life she captures. With passion so much in evidence, Jenny’s work is a perfect way to begin the Valentine’s weekend with a reception on Saturday morning, February 13th, at BlackBird Frame & Art. Meet the artist, new to the Asheville area, and savor her work while sipping coffee and enjoying some Valentine treats (best shared!). Be one of the first 14 visitors to bring a snapshot of you and your Valentine, be they a lover, parent, child or best friend, and BlackBird will reward you with a free 5x7 frame, professionally fitted with your photo. BlackBird Frame & Art is an independent art gallery and custom frame studio owned by Pat and John Horrocks and located at 365 Merrimon Ave in Asheville; a second frame studio adjoins their workshop at 30 Bryson Street, just north of Biltmore Village, across from Kinko’s. The Small Business of the Month for the month of February is Allegra Print & Imaging located at 191 Charlotte St. in Asheville. Allegra was established as Insty Prints on Merrimon Ave. in 1986 and became Allegra 5 years ago at the time of the move to Charlotte St. Allegra employs 7 full time personnel. Allegra offers direct mail printing, copying, color copies, and full color printing. Additionally, the company produces banners, posters, and large format printed items. Allegra supports the Footprint Fund, which invites all non-profits to submit applications for donations once a year. A panel chooses ten of the applicants for donations. Western North Carolina has a great tradition of visitors who tour our diverse cities and towns. Our talented regional chefs have always been ready to welcome them with exceptional cuisine that highlights local foods and products. A preliminary group of 16 chefs, selected from the 17 western counties, will participate in the initial Cook-Off competitions. The America Culinary Federation, WNC Chapter, will supervise the competitions and judging, which will be scored on Presentation, Creativity, and Taste. Judges for the final competitions are from local media sources, organizations, and educational institutions. The kickoff for WNC Chef’s Challenge will be in April where we will introduce the 16 selected contestants and their restaurants in a gala event in Asheville. Following the kick-off will be 12 separate events to narrow the preliminary group down to the final four chefs, who will compete at The Asheville Wine & Food Festival on August 14, 2010. We will be advertising throughout North Carolina, South Carolina, Georgia, Tennessee, and Virginia through the efforts of WNC Magazine, Foodtopia Asheville (Asheville TDA), regional radio and TV stations, plus the blogs and social networking sites for Slow Food Asheville, Slow Food USA, Twitter, and Facebook. To submit your application for the WNC Chef’s Challenge, email us at info@ashevillewineandfood.com or call us at 828.777.8916 and we will send you an application and additional information. There is no fee to enter and all applicants must reside in WNC. If your restaurant is interested in hosting one of the 12 competitions, please contact us at info@ashevillewineandfood.com or call us at 828.777.8916 to learn how this innovative event can bring recognition, new customers and additional revenue to your establishment. First Light Solar (a division of FLS Energy) becomes the first solar energy company to be approved by the Historic Resources Commission of Asheville and Buncombe County (HRC) to install solar thermal panels on an existing residential structure in the historic Montford district. With this in mind, the Fahrer’s selected First Light Solar, a local Asheville company that had a unique solution to the aesthetics issue. “First Light Solar specializes in Velux solar thermal systems. Velux has been manufacturing and selling solar thermal systems in Europe for 14 years but is just now breaking into U.S. markets,” explains Grant Gosch, director of First Light Solar. “It’s a unique system because it’s mounted and flashed into the roof so it has a very low profile and is aesthetically pleasing. Basically, it looks just like a skylight,” says Gosch. Representatives from First Light Solar and the Fahrer’s, along with other Montford residents, presented the proposed solar thermal project to the HRC on January 20, 2010. “The board considered the solar installation proposal with open-minded enthusiasm,” says Fahrer. "They really wanted to be educated on solar energy solutions for Asheville’s historic districts. I think First Light Solar and Velux did an excellent job of addressing the HRC’s concerns over visibility and preserving the architectural integrity of the structure,” says Fahrer. The HRC approved the First Light Solar/Velux solar thermal installation project on Thursday, January 21, 2010. “The approval of this solar technology is a total victory for the community of Montford,” says Tiffany Smith Schroeder, a Montford resident and sustainability consultant and environmental policy writer who consulted on the proposal. “Many homeowners are indeed excited because they now know the HRC is open to solar energy solutions on existing structures as well as new construction,” says Smith Schroeder. The Fahrer’s were also excited and encouraged by the outcome. “With this approval, it’s our hope that it will be easier for others to apply for solar energy systems, and that in the near future, it will be considered minor work that could be approved without a review board hearing,” says Fahrer. "We also hope that we get our Energy Star Certification – thanks in part to the solar thermal system – and become the first Energy Star Certified home in Montford." The First Light Solar/Velux installation is scheduled to occur on Monday, January 25, 2010. “We are very excited about providing this forward-looking energy solution to the Fahrer’s and the historic Montford district,” says Gosch. “This one-panel system will produce up to 50 gallons of hot water a day and reduce hot water heating costs by up to 80% – all while looking terrific!” The Fahrer’s are also eligible for a 30% Federal and 35% State Tax Credit and a possible $1,000 rebate from Progress Energy. According to Gosch, there has never been a better time in history to go solar. For more on First Light Solar visit http://www.firstlightsolar.com or contact FLS Energy at 828.350.3993. First Light Solar, based in Asheville, N.C., is an award-winning solar energy design and installation company providing residential and light commercial clients with the latest technology in photovoltaic (PV) and solar thermal (hot water) energy systems. The Harlem Globetrotters are coming to the Asheville Civic Center on Sunday March 14 @ 3 p.m.! The Chamber has arranged for some discount tickets for Chamber members. Please share with your staff, friends, and family. The form can be downloaded by clicking here! Justin from Asheville Now takes a spin over to the grand opening of the Wine Studio of Asheville and interviews Jessica Gualano. The Wine Studio celebrated its grand opening in early January. Jessica has a great space on Charlotte Street. The Wine Studio of Asheville and Jessica were also featured in the Citizen-Times over the weekend, check out the story here. The HomeTrust Banking Partnership announced today that their partnership with Industrial Federal Savings Bank has been finalized and the combined partnership became effective as of 11:59 p.m., January 31, 2010. Industrial Federal is the sixth mutual bank to come together in this partnership; other banks include Shelby Savings Bank, Tryon Federal Bank, Home Savings Bank of Rockingham County, Rutherford County Bank, and HomeTrust Bank of Asheville. Industrial Federal Savings Bank’s name, all its employees, directors, and officers remain unchanged. The HomeTrust Banking Partnership is a unique strategic alternative for mutual savings banks, where each partner maintains their identity while benefiting from the combined strength of all the partners. Industrial Federal will be able to provide customers additional products and services available across other partner banks by June 1, 2010; after the bank’s systems have been combined with the HomeTrust Bank Partnership systems and operations. HomeTrust Bank is an FDIC-insured, mutually owned bank with an 83-year history of serving families and businesses in Western North Carolina. HomeTrust Bank (www.hometrustbanking.com ) along with Tryon Federal Bank, Shelby Savings Bank, Home Savings Bank and Rutherford County Bank, comprise the HomeTrust Banking Partnership. HomeTrust Banking Partnership has assets of over $1.6 billion and is the largest mutual bank headquartered in North Carolina and the 2nd largest in the Southeast. 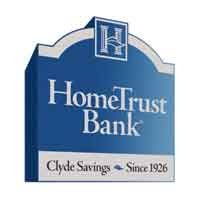 With the addition of Industrial Federal Savings Bank, the HomeTrust Banking Partnership will have 19 offices: Industrial Federal Savings Bank in Davidson County (3); HomeTrust Bank in Haywood County (2), Buncombe County (5), and Henderson County (1), Home Savings Bank in Rockingham County (3), Shelby Savings Bank in Cleveland County (2), Tryon Federal Bank in Polk County (2), and Rutherford County Bank (1). The Partnership’s combined assets will exceed $1.6 billion, making it the 13th largest banking organization headquartered in North Carolina. Union Transfer & Storage of Arden is celebrating its 55th anniversary as a United Van Lines agent. United Van Lines began its tradition of quality customer service in the moving industry sixty years ago. As the Asheville area’s longest running United Van Lines agency, Union Transfer & Storage has helped thousands of families move from across the street to around the globe. Over the years, Union Transfer & Storage has built a solid reputation for quality moves. Businesses of all sizes have relied on them as well. Mission Hospitals, The Grove Park Inn, the Asheville Chamber of Commerce and Arvato Digital Services (formerly Sonopress) are just a sampling of the satisfied customers. Owner Wayne Campbell started in the moving industry as a packer and loader over 38 years ago. Wayne’s wife, Sue Campbell and son, Robie Campbell work side by side with him to ensure the highest level of quality on every move. Union Transfer & Storage features a 30,000 square foot, climate controlled warehouse located at their office site at 6 Trident Drive in the Vista Industrial Center. Office hours are 8 a.m. to 5 p.m. Monday through Friday. Phone number is (828) 209-0171. Publication of the local food bumper sticker and Local Food Guide for kids is made possible by funding from the Community Benefits Program of Mission Hospital. The new, ninth annual edition of ASAP’s Local Food Guide, listing hundreds of family farms and businesses that use local ingredients, will also be available around the region in spring 2010. Both guides are free. The kid’s Local Food Guide is unique in its focus on Buncombe County—and kids. The kid’s guide will highlight ways children can access local food: in school cafeterias—including the Asheville City and Buncombe County public schools’— as well as at school gardens, farmers markets, and farms offering tours and other kid friendly experiences. The guide will profile regional farmers and their children, so kids can see who grows their food—and that kids like them play a role in the local food system. The kid’s Local Food Guide will also include activities, such as farmers market scavenger hunts and recipes kids can make themselves, to encourage them to become the next generation of local farm supporters. To help teachers use information about local food and farms in the classroom, ASAP will offer free lesson plans to complement the guide. ASAP also provides many other curriculum materials; guidance on how to serve local food in cafeterias and establish school gardens; and cooking kits, seeds, and other resources. “If you are interested in Farm to School programming, go to our website www.growing-minds.org. Winter is a great time to plan,” Jackson urges. The kid’s guide and bike bumper stickers will be distributed to all elementary schools in Asheville City and Buncombe County school systems, as well as to the Buncombe County Health Center and the Department of Social Services. Please contact Program Coordinator Molly Nicholie at molly@asapconnections.org or 828-236-1282 for resources, or to share ideas for content related to local food for the kid’s guide. ASAP is the Southeast regional lead agency for the National Farm to School Network (www.farmtoschool.org).